Today we start a new challenge at Colour Crazy and our wonderful sponsor is Polkadoodles. They were generous and supplied images for the DT to use. Mine is called "Forest Friends" and I think it's one of the most delightful images I've seen this season. It features an adorable woodland fairy with two of her little forest friends; a deer and and a bunny. I think deer are my favorite Christmas animals but that's probably because of the association with Santa's reindeer, which are favorites of all children because they deliver Santa and the presents! I colored the image with ProMarkers, and added "Frosted Lace" Stickles to the furry pieces of her dress and scarf. I used loose glitter on her halo and added touches of white gel ink to the snow on the tree. I used gold paint pen on her little wings. The frame for the image and the large snowflake were cut with dies from Spellbinders. The sentiment pieces were cut with a Die-Versions die. I used that deep, burgundy red for all the die cuts because it's my favorite when combined with traditional Christmas greens. Such a sweet image and a beautiful card! SO PRETTY! I do agree that burgundy with green just oozes Christmas. Love the spellbinders frame with this gorgeous image. Thankyou for coming and spinning the butterfly wheel with me this week. Hugs Mrs A. Such a beautiful card. I love your colouring. Thank you for sharing with us at Creative Inspirations, good luck and I hope you will join us again. Love this card and the gorgeous image. Beautiful coloring my friend. What a sweet card! Love the image and the way you colored it! Great card! Thank you so much for playing along at I ❤ Promarkers! Hope to see you again next time! Hello Connie, another wonderful creation! A stunning card design and beautifully coloured. I love how you've framed it. 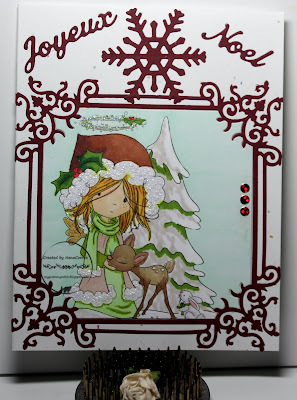 Thank you for sharing your beautiful make with us over at Polkadoodles Challenge and hope you will join us again.